An early commission for a private home. The Charles Hosmer Morse Museum of American Art, Winter Park, FL © The Charles Hosmer Morse Foundation, Inc. Many books and articles have been written in the last several years about Tiffany Studios, and of course, Louis Comfort Tiffany. This article will endeavor to make a concise overview of this well-known American artist, best known for his involvement with stained glass windows and lamps. He and his firm also designed mosaics, metal and glass bases for lamps, exotic jewelry and enamel work. Over the years the name "Tiffany" has become synonymous with any stained glass window containing opalescent glass… and even some windows that do not. But there are hallmarks of stained glass by the Tiffany firm that, with some astute examination, can assist in determining if the stained glass in question is "Tiffany." 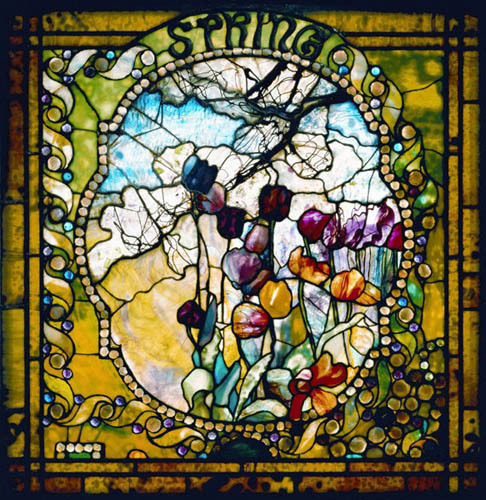 There are many stained glass windows in Michigan by the Tiffany Studios and some of them will be featured in this discussion. Just who was Louis Comfort Tiffany? He was born in 1848 almost literally with a silver spoon in his mouth as his father had worked very hard in establishing the Tiffany Company in New York City, selling high-end jewelry and silver products. In order to place the year of his birth in historical context, it is interesting to note this was the year of the Gold Rush to California and the Mexican American War; the year Wyatt Earp was born and Wisconsin became a state; and the election of Zachary Taylor as President of the United States, the first time all states voted on the same day1. By the time Tiffany died in 1933, he was in relative obscurity. Tiffany art works were out of style and he had been somewhat reclusive on his Laurelton Hall estate near Oyster Bay on Long Island. What brought about the sensational revival of interest in anything associated with the name "Tiffany"? As we look at the life of Tiffany, personally and professionally, the reasons for the revival of popularity in the 1960s and 70s will unfold. Notably, this year, 2008, is the 160th anniversary of his birth. Happy Birthday, Louis! As expected, Tiffany attended private schools as a child, and early on seemed to excel in art as evidenced in his early paintings and drawings. As he got older, Louis disappointed his father when he insisted on not going to work at the Tiffany store, but instead, upon graduation from high school in 1865, toured Europe and North Africa with an older sister for the better part of a year. Here he was exposed to the art of various cultures that ultimately influenced the character of his work2. The Charles H. Morse Museum of American Art in Winter Park, FL has a large collection of artworks including paintings done by Tiffany throughout his lifetime3. In discussing the life of Louis C. Tiffany, it is useful to divide it into three main areas of influence— one is the involvement with interior decorating; another is the design and fabrication of lamps; and the third is the design and fabrication of stained glass windows. First, let's look briefly at the involvement with interior decoration. Tiffany married in 1872 and it was in this time frame he began his involvement with interior decoration, first with his own home that he decorated in a richly textured style. He began the first of several businesses where he and various partners each provided their own specialty and design interests for their clients,4 many of whom were acquainted with and/or patrons of Tiffany's father. It was during this time that he started to experiment with the manufacture of glass for mosaic tiles, molded jewels and other glass interior accents. By 1879 Tiffany had received his first commission for a private home that included stained glass windows, furniture, wall treatments, fireplace surrounds, etc. He was drawn to provide interior designs for the newly rich who lived the post Civil War opulent life style. Tiffany worked closely with a few architects on these private homes, men's clubs, hotels and theaters, leaning towards the exotic, with gilded features and highly decorative surfaces5. In 1882, the firm was invited to provide interior decorations for the White House of President Chester Arthur. This included a large stained glass screen which was installed to eliminate cold drafts from entering the White House6. The screen was in place until the 1904 presidency of Theodore Roosevelt when it was removed. Much has been written about the removal of the screen, some stating that "Roosevelt had it broken into little pieces." Recently a complete history of this situation was researched by attorney Sheldon M. Finkelstein7. Both lamps are from The Charles Hosmer Morse Museum of American Art, Winter Park, FL © The Charles Hosmer Morse Foundation, Inc. The second area of influence was that of the design and manufacture of lamps. The name Tiffany today seems to be synonymous with any lamp utilizing colored glass, partly due to the large number of fakes and also due to a lack of accurate knowledge. The Antiques Road Show has made the public more aware of the fakes, but they have proliferated due to similar glass still being made by several glass manufacturers. However, lamps really didn't enter into the overall picture until the early 1890s, long after the manufacture of stained glass windows. Early on, the Tiffany firm used blown glass bowls to hold the fuel oil for pre-electric lamps— these were discontinued by 1910. The electric light bulb had been available to the wealthy for about 10 years since the 1880s, and Tiffany had already utilized this new lighting in the decoration of a New York theater. The bright light from electric bulbs needed to be shielded somewhat and directed downwards to be useful for reading. 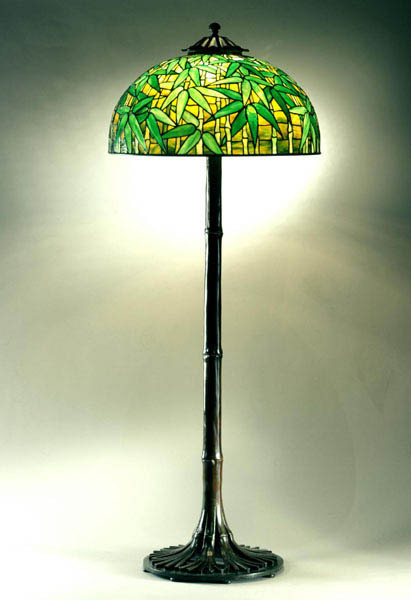 Taking the same technique from stained glass windows, but on a smaller scale, lamp shades were designed and constructed with small pieces of colored glass. Tiffany had been greatly inspired by the beauty in nature and many of these lovely lamps exhibited various aspects of nature. The lamps have now been catalogued into several groups depending on the shape of the upper border, the lower border, overall shape of the lamp, and whether the lamp had as its theme specific flowers, fruit, leaves, insects, spider webs…. for the table, desk or floor, and the type of base8. Some have wondered if the fabrication of lamps allowed the studio to use up the small pieces of glass left over from the years of making stained glass windows. There are pros and cons to this thinking. Some geometric lamps needed glass that was variegated in such a manner that indicates it was made specifically for that lamp. 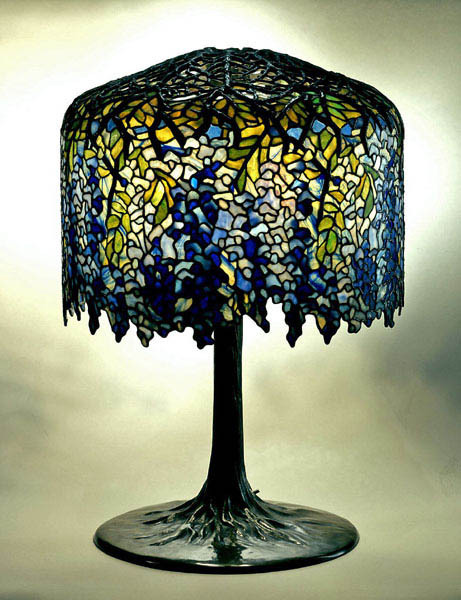 Additionally, there is existing evidence in the Neustadt Collection of Tiffany Glass that suggests glass was produced specifically for lamp production9. There are old black and white photographs of the Tiffany Studios that show the wood molds over which the lamps were formed. For the most part, only men are in these photos as Tiffany felt women did not have the aptitude to select the glass colors. In recent years astounding information has come to "light." Tiffany expert and professor emeritus of art history at Rutgers University Martin Eidelberg was giving a talk in Seattle and afterwards was approached by a man who said he knew of some old letters which concerned the Tiffany Studios, and specifically a person Eidelberg had mentioned in his talk, Clara Driscoll10. When Eidelberg finally received copies of the letters, he was thrilled. As it turns out, "round robin" letters written by Clara Driscoll, an employee at the Tiffany Studios but born in mid-Ohio, were found in a repository in New York and at the Kent State University library in Akron, OH. These letters literally have changed the written history of the Tiffany Studios, in that Clara Driscoll discussed her role, and that of many other women, in the designing and glass selection for lamps and stained glass windows11. At one time the male employees went on strike because they felt there were too many female workers. The strike was settled by reducing the number of women of women to 23, rather than the high of 35. Clara Driscoll was very much involved in this situation. Most likely it will take researchers at least five to ten years to research the other women Driscoll mentioned in her letters. Beecher House, Wayne State University, Detroit. Photo by Barbara Krueger. 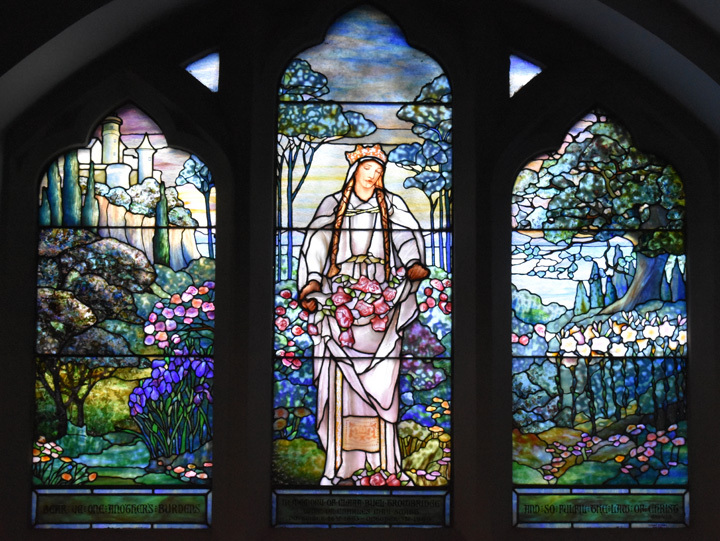 The discussion of stained glass windows will center on the Tiffany windows located in Michigan. There are several categories into which stained glass windows can be placed: religious or non-religious, and figural or non-figural/decorative. 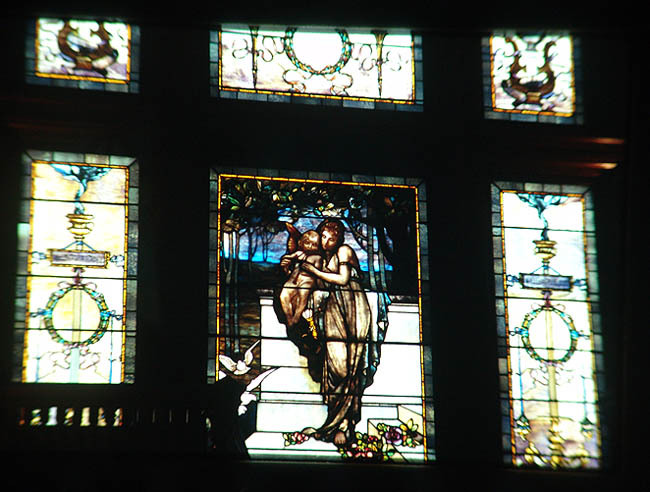 One of the most well-known Tiffany windows in Detroit can be found at the Beecher House, a late 19th century mansion now part of Wayne State University. The window, which combines figural and non-figural elements, can be found at the central image on the cover of the Alastair Duncan book, Tiffany Windows12. Opalescent glass was formulated to suggest foliage, folds of clothing, petals of flowers, and other details which could eliminate the use of glass paint. Frequently several layers of glass are placed one over the other to give a sense of depth and to give a wider range to the color selection. Over the years dirt has accumulated between the layers of glass effectively obscuring the original intent. Here is an "after" photo of the Beecher House window. St. Matthew's-St. Joseph's Episcopal Church, Detroit. Photos by Barbara Krueger. 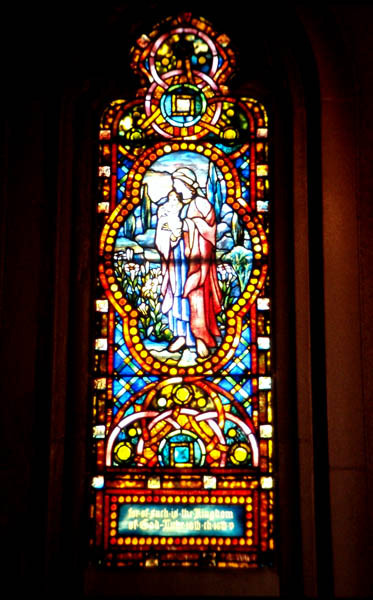 Another set of interesting Tiffany windows can be found at a Detroit church where old photos indicate that the windows have been moved from behind the baptistery to a secluded location in the tower13. Dedicated to the donors' deceased mother, the windows date from the late 1920s and have a different "hand" for the flesh areas than do windows dating from before 1920. By the mid-1880s, Tiffany hired talented artists who excelled in the human figure and who had talent in liturgical subject matter. In a very interesting change in philosophy, soon there was the effort that began to deviate from accepted religious themes for stained glass windows and to "sell" idealized landscapes and floral panels as "religious" art….and of course courting the benefactors willing to buy into this new way of thinking. Christ Church Detroit—St. Elizabeth of Hungary. Photo by Barbara Krueger. Close-up photo courtesy of Christ Church. Another Detroit church with Tiffany stained glass windows is Christ Church, an early Episcopal church in Michigan. This window depicts St. Elizabeth of Hungary with her apron filled with flowers, which miraculously replaced bread to feed the poor. The same female image can be found in a Tiffany triptych at the American Red Cross building in Washington DC. ; however here the woman is Una, wife of the Red Cross knight. Tom Venturella of Venturella Studio in New York has stated he has seen a third image of the woman with roses in her apron. This window came from a razed church in New York that someone brought to him for repair a few years ago. And there may be others. This duplication of images points out that it was not unusual for studios to reuse already drawn cartoons with certain popular images, and this included all stained glass firms, not just Tiffany Studios. Some of the more common replicated images are Christ with Little Children, Christ the Good Shepherd, Christ Knocking at the Door, and Christ at the Rock of Gethsemane14. Recently in preparation for a talk about Tiffany Studio which was presented February 2008 at Reid Memorial Presbyterian Church in Richmond, IN the church provided copies of 1906/1909 communications from the Tiffany Studios to their church indicating from hence forth duplicates of stained glass images would not be made unless both churches involved were informed and agreed, especially "old masters." Speaking of duplicates, the public library in Richmond has a Tiffany stained glass window with a Gutenberg theme15 which is a duplicate to one found in the Winchester, MA public library. Hobbs and Black, Ann Arbor, MI. Photos by Barbara Krueger. Another interesting Tiffany situation can be found in Ann Arbor at what is now the architectural firm of Hobbs and Black. The older church had been used as a recreation building and the Tiffany window covered up for about 40 years when it was "discovered" during renovations by the architectural firm. The location of the window facing east along a driveway allows the sun to shine directly on the window only for a very brief time each morning, illuminating the village at the bottom, which is not shown here. 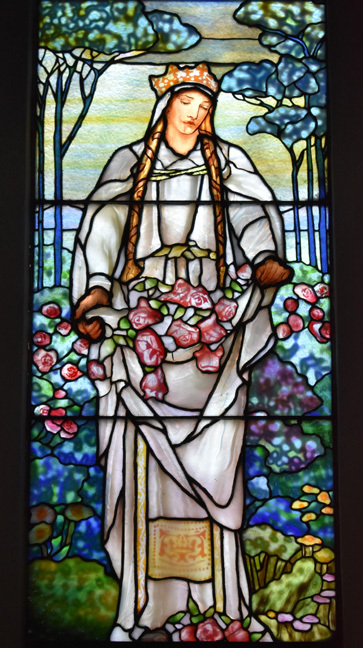 Another Ann Arbor Tiffany window can be found at the University of Michigan's Kelsey Museum, originally built as the Y.M.C.A. This purely ornamental window is very large, although not on view to the public without prior permission and currently undergoing repair work16. Left: First (Park) Congregational Church, Grand Rapids. Photo by J. William Gorski. Right: St. Cecilia Music Society, Grand Rapids. Photo by Leisa Eckerle Hankins. 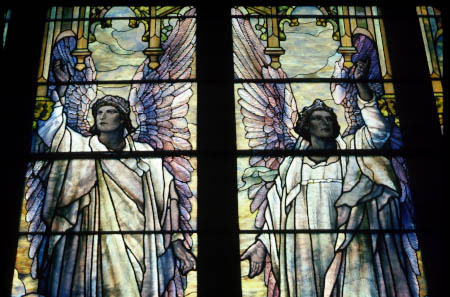 The huge Angels of Praise window at First (Park) Congregational Church in Grand Rapids was damaged by a 1988 fire, along with a dozen other Tiffany windows. The plating and acid etching can be seen from the choir loft where one can get very close to the window. 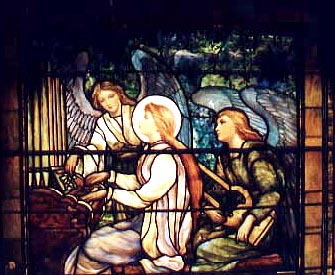 Also in Grand Rapids is St. Cecilia Music Society, which has an interesting connection to Tiffany Studio. 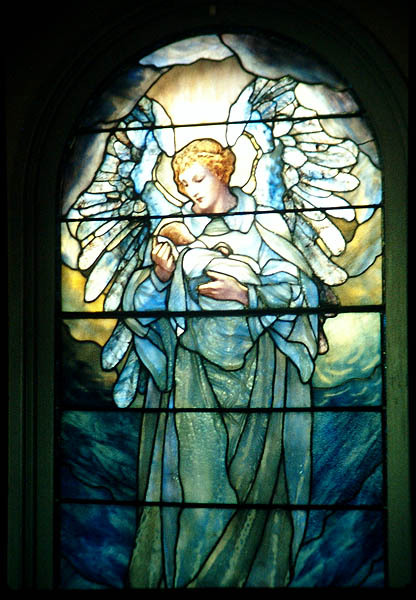 A painting by Frederick S. Church (born in Grand Rapids and NOT Frederick E. Church who built the home, Olana) who was a somewhat well known landscape painter and a member of the Hudson River School, was used as the model for the stained glass. One wonders about Church's connection with Tiffany, but as both were New York artists, their paths apparently crossed. "In Memoriam Winifred Wightman 1865-1875," Southwest Michigan. Photo by Barbara Krueger. Another church with an interesting Tiffany stained glass window is found in a small town near Grand Rapids. The image of the little girls is taken directly from a 1787 painting by English artist Joshua Reynolds, made for an English woman as a memorial to her deceased daughter. 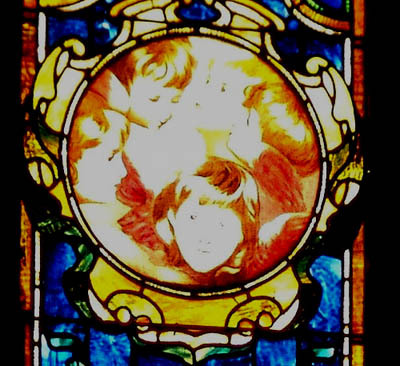 At least two other similar stained glass images have been located in the US, neither by the Tiffany Studios17. 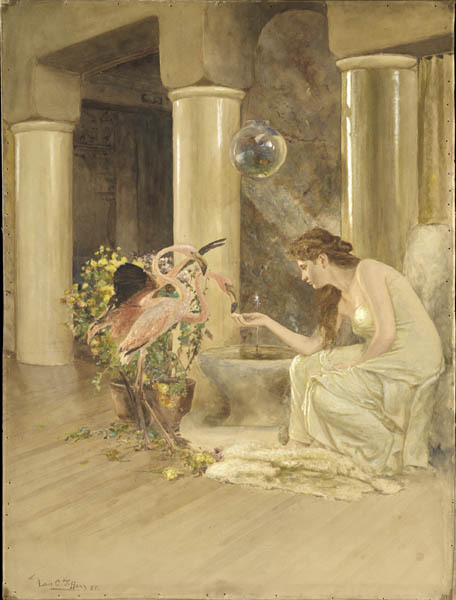 "Feeding the Flamingoes" (left) is an 1885 watercolor painting by Tiffany that became the basis for the stained glass window (right) exhibited at the 1893 Chicago World's Columbian Exhibition, later installed at Laurelton Hall and now at the Charles Hosmer Morse Museum of American Art, Winter Park, FL © The Charles Hosmer Morse Foundation, Inc. When Tiffany's father died in 1901 and left him over $3,000,000, Tiffany built Laurelton Hall at Oyster Bay on Long Island and sold his nearby summer residence. By 1916 Tiffany had withdrawn from his role at the studio and was living full time at Oyster Bay. Laurelton Hall was a total unified environment designed by Tiffany— Moorish architectural style, exotic interior decoration and the landscaping of over 560 acres. Many of Tiffany's favorite paintings and stained glass works were installed here, along with the chapel from the 1893 Chicago World's Columbian Exhibition which he purchased from St. John the Divine in New York18. Between 1918 and 1920 Tiffany formed the Tiffany Foundation, which brought many young artists to Laurelton Hall to study and receive critiques on their art work19. This included Hugh McKean (1908-1995), who later was to become a major patron of the work of Tiffany Studios20. By 1932, Tiffany Studios filed for bankruptcy, with Tiffany passing away in 193321. In 1935 Dr. Egon Neustadt and his wife purchased their first piece of a Tiffany-made object, a small desk lamp, and this effectively began their quest for items made by the Tiffany firm. Although at the time "out of favor" and "out of style," the Neustadt's collection, which is at the Neustadt Collection of Tiffany Glass on Long Island, has permitted increasingly comprehensive research into all aspects of the Tiffany firm, many of which have remained somewhat elusive over the years. For example, for over 30 years, crates of large and small pieces of glass sat in various storage areas until the Neustadts purchased them in 196722. Several events occurred which have been significant in regard to the Tiffany Studio. First of all, in 1942 Jeannette Genius (1909-1989), soon to be the wife of Hugh McKean, opened an art gallery on the campus of Rollins College in Winter Park, FL where she had been a student. Jeannette Genius was from a wealthy Chicago family who had wintered in Winter Park, and her grandfather owned pieces of Tiffany artwork23. Between 1946 and 1949 the Tiffany Foundation's support of Laurelton Hall and young artists was dissolved and Laurelton Hall was sold. Much of the art collection left in the house was sold. In 1953-1955 the now married McKeans held an exhibit at Rollins College of her grandfather's collection of Tiffany objects; this was probably the first Tiffany exhibit. In March 1957, there was a major fire at Laurelton Hall. A Tiffany daughter, aware of the McKeans' interest, notified them many architectural items and stained glass windows were still intact. By May, trucks were sent to bring everything to Florida. Unfortunately, the haste of this was without much regard for breakable things, and some items were damaged. In 1958, an exhibition at the Museum of Contemporary Crafts in New York featured Art Nouveau and Tiffany objects. This exhibit had been encouraged and enhanced by the antique dealer Lillian Nassau, who was courting collectors and continued to do so until her retirement in 1982. In order to make the Rollins College collection more accessible to the increasing number of winter tourists, in 1977 all the Tiffany items were moved to a non-descript building in downtown Winter Park and the art gallery reopened. In 1978, a stained glass ceiling was sold at a Sotheby's auction in New York for a then world's record of $60,500. This was followed by auctions with increasingly higher prices for Tiffany windows and lamps24. Between the Laurelton Hall fire and the late 1980s, the McKeans endeavored to locate and purchase much of the artwork that had been sold from Laurelton Hall including all the various components of the chapel that had been shown at the1893 World's Columbian Exhibition in Chicago. These items were to become the nucleus for the Charles H. Morse Museum of American of American Art, named for Mrs. McKean's grandfather. In 1995-96 the Trustees of the Morse Museum purchased a former bank and other nearby buildings and constructed a new and larger museum, which was designed to eventually hold the 1893 Chapel. Unfortunately Mr. McKean passed away a few months prior to the opening of the Museum. In the Museum one can view the well-known Four Seasons stained glass windows from Laurelton Hall. Left: "Spring," from the Four Seasons. Right: "Autumn," from the Four Seasons. 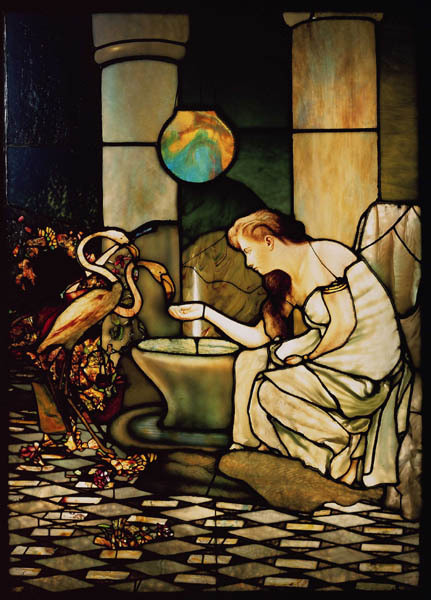 The Charles Hosmer Morse Museum of American Art, Winter Park, FL © The Charles Hosmer Morse Foundation, Inc.
Tiffany had the window cut into smaller sections to fit into specific locations in Laurelton Hall. It had been in sections for many years, but in 2001 was "united" with the original borders. Most of the stained glass restoration for the Morse Museum is done by the Venturella Studio of New York City.25. Another window on display at the Morse Museum is the View of Oyster Bay, commercialized over the years on everything from note cards to mouse pads. It was made for a client, not by Tiffany himself, but probably is an idealized view of Oyster Bay, one which may have been seen from the porch at Laurelton Hall. View of Oyster Bay. The Charles Hosmer Morse Museum of American Art, Winter Park, FL. © The Charles Hosmer Morse Foundation, Inc.
Tiffany was an artist, entrepreneur, world traveler, avid naturalist, photographer, collector, parent, and grandparent. What would he think about how people perceive the products of his firm, these many years later? Collectors have driven up the prices for Tiffany lamps and there seems to be no end in sight. But, the demand has far exceeded the supply and so imitations are unfortunately common. Many churches, municipal buildings and private homes with Tiffany stained glass windows have been demolished with the windows ending up who knows where… some were demolished with the buildings, and others have ended up in Japan where a collector opened his own museum in 1994. Other windows remain in partially viable churches, where, if the current practice for "green building" continues, perhaps they may still be available for viewing for the next generation. As stated in the beginning, this has been an overview of the Tiffany firm, based partially on the February talk in Richmond, IN, and the stained glass windows found in Michigan. For those who would like more details on specific aspects of Tiffany and the Tiffany firm, there are many books, some of which are out of print but can be found on used book web sites; many libraries allow interlibrary loan of books to test the waters if one really wants to purchase a book. Needless to say, my inventory increased by two when I began researching this project. 1"Events of 1848" (2008). http://en.wikipedia.org/wiki/1848. 2Frelinghuysen, Alice Cooney. Louis Comfort Tiffany at the Metropolitan Museum. New York: Metropolitan Museum of Art, 1998. 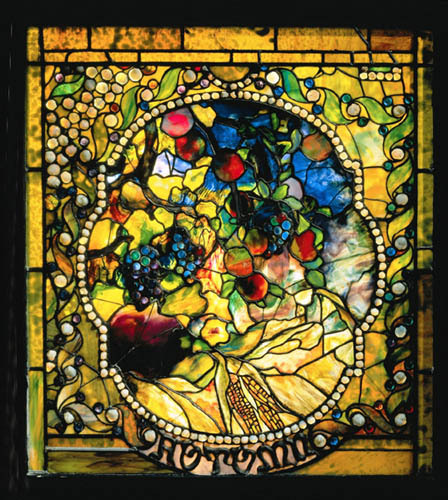 This booklet is a reprint of the Summer 1998 Metropolitan Museum of Art Bulletin and was printed for the exhibition which celebrated the 150th anniversary of Tiffany's birth. Distributed by Harry N. Abrams, Inc.
3Charles Hosmer Morse Foundation, Inc. "Charles Hosmer Morse Museum of American Art, Winter Park, Florida" (2008). http://www.morsemuseum.org/collection/documents/GalleryIXPaintingGuideNov07.pdf. 4The many business affiliations and partners Tiffany was associated with have been discussed in many publications but are not the subject of this discussion. 5Koch, Robert. Louis C. Tiffany, Rebel in Glass. New York: Crown Publishers, 1966. Koch (died in 2003 at age 85) began studying Tiffany in 1955 while at Yale University after writing a paper about a New York building which had been decorated by Louis Comfort Tiffany. He was able to visit Tiffany's home at Laurelton Hall on Long Island before it burned and was provided old photographs, newspaper clippings, and recollections by three of Tiffany's grandchildren. Koch was involved with a very early (1958) exhibition on Tiffany's work held at New York's Museum of Contemporary Crafts which set into motion the revival of interest in Tiffany. His book has been considered seminal concerning the early history of Louis Comfort Tiffany. 6The White House Historical Association. " Chester A. Arthur 1881-1885" (2008). http://www.whitehousehistory.org/04/subs_pph/PresidentDetail.aspx?ID=21ℑID=984. 7Thanks to Gail Barden librarian/archivist at Rakow Research Library at Corning Museum of Glass for the initial information. Sheldon M. Finkelstein, New York attorney, responded to my query on what motivated him to research and write the article: " I was a major in American Studies in college and my wonderful department chair and faculty advisor taught me the value of an inter-disciplinary approach as a more accurate way to try to determine the truth of matters. Of course, this requires a broad base of knowledge in the liberal (and perhaps the less liberal) arts. And so when I came across something that, in my litigator's mind, just didn't sound right—that TR wanted the Tiffany window broken into little pieces because it supposedly didn't fit in with TR's esthetic desires for the White House—I asked myself why would TR have been so vehement on this issue? This wasn't a matter of esthetics. There had to be more to it and the opinion in the art world was wrong. And then I realized they were virtually next door neighbors. There is an old saying that "All politics is local" and TR was a man of the people at least in his politics while Tiffany was anything but. And so the more I dug, the more I came up with and one thing led to another….." The Finkelstein article was reprinted in the online magazine, Stained Glass Journal of America, and can be read here: http://www.stainedglassjournal.com/home.html. 8Neustadt, Egon. The Lamps of Tiffany. New York: Neustadt Museum of Tiffany Art, 1970. 9It is interesting to note from a January 31, 2008 correspondence with Lindsy R. Parrot, Collections Manager and Associate Curator at the Neustadt Collection of Tiffany Glass where she discusses the many crates of small pieces (over 150,000) of glass in their collection that Egon Neustadt purchased in 1967. Neustadt and his wife were very early (1935) collectors of Tiffany objects. See also "Egon and Hildegard Neustadt" (2007). http://www.neustadtcollection.org/about/egon_hildegard.php. 10Eidelberg, Martin. Correspondence with author, 19 February, 2008. 11Eidelberg, Martin P., Nina Gray, and Margaret K. Hofer. A New Light on Tiffany: Clara Driscoll and the Tiffany Girls. London: New York Historical Society, in association with D. Giles Ltd, 2007. 12MacDowell, Betty. 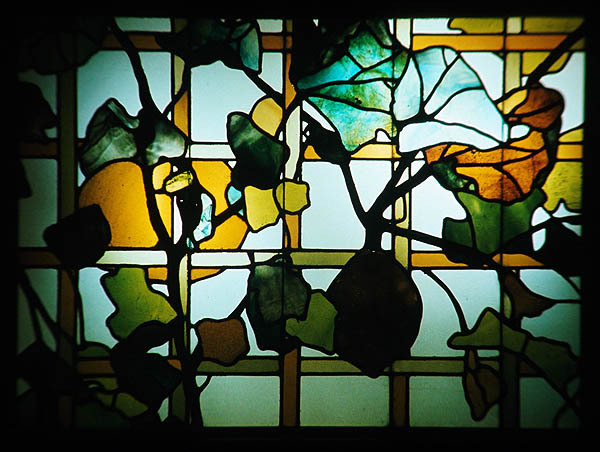 "Michigan Stained Glass Census Featured Window of the Month for June, 2002" (2002). http://museum.msu.edu/museum/msgc/jun02.html. 13www.detroit1701.org. "St. Matthew's-St. Joseph's Episcopal Church" (2005). http://www.detroit1701.org/St.%20Matthew-Joseph%20Episcopal.html. 14Weis, Helene H. "Familiar Faces," Stained Glass Quarterly. Fall 1991, 204-207. 15Duncan, Alastair. Tiffany Windows. New York: Simon and Schuster, 1982, p. 29. 16The Kelsey Museum of Archaeology, University of Michigan. "The Kelsey's Fox Memorial Window by the Tiffany Glass Company" (2002). http://www.lsa.umich.edu/kelsey/research/Publications/spring2002/tiffany.html. 17Krueger, Barbara. "Where is Winifred?" (2006). http://www.stainedglassjournal.com/weird.html. 18Charles Hosmer Morse Foundation, Inc. "Tiffany Chapel" (2008). 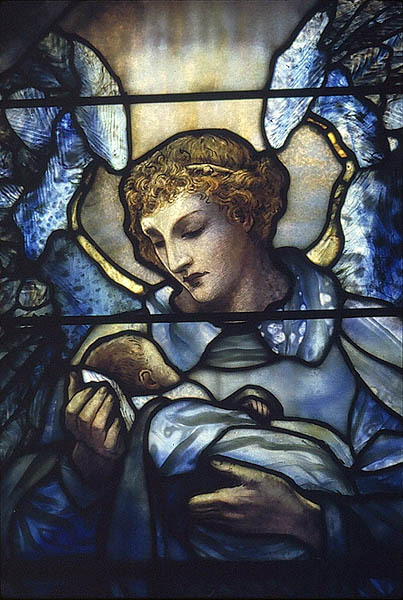 http://www.morsemuseum.org/collection/tiffany_chapel.html. 19The Louis Comfort Tiffany Foundation. "About the Foundation" (2008). http://www.louiscomforttiffanyfoundation.org/info_about.asp. 21The New York Time Company. "On This Day" (2008). http://www.nytimes.com/learning/general/onthisday/bday/0218.html Find a Grave. "Louis Comfort Tiffany" (1998). http://www.findagrave.com/cgi-bin/fg.cgi?page=gr&GRid=2957. 22Neustadt Collection of Tiffany Glass. "Egon and Hildegard Neustadt" (2007). http://www.neustadtcollection.org/about/egon_hildegard.php. 23Charles Hosmer Morse Foundation, Inc. "Jeannette Genius McKean" (2008). http://www.morsemuseum.org/about/jeannette_mckean.html. 24A photo of this ceiling can be seen in Duncan, Tiffany Windows, pl. 97. 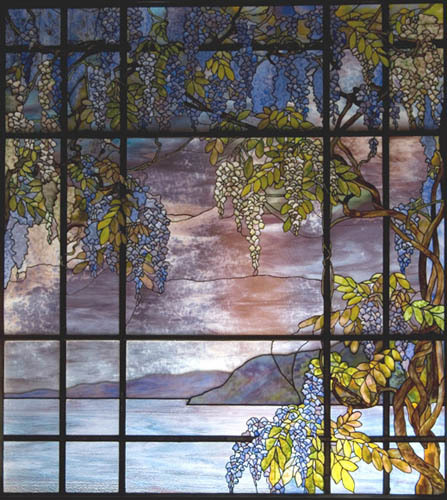 25Charles Hosmer Morse Foundation, Inc. "Morse Reunites Panels in TiffanySeasons Window" (2001). http://www.morsemuseum.org/news/pr_pdf/Morse%20Reunites%20Panel.pdf. Burlingame, Michael John. The Last Tiffany: A Biography of Dorothy Tiffany Burlingame. New York: Atheneum, 1989. De Kay, Charles. The Art Work of Louis C. Tiffany. Poughkeepsie, NY: Apollo, 1987. Duncan, Alastair. Louis Comfort Tiffany. New York: H.N. Abrams in association with the National Museum of American Art, Smithsonian Institution, 1992. Duncan, Alastair. Tiffany Windows. New York: Simon and Schuster, 1982. Duncan, Alastair, et al. Masterworks of Louis Comfort Tiffany. New York: Abrams, 1989. Eidelberg, Martin P., et al. A New Light on Tiffany: Clara Driscoll and the Tiffany Girls. London: New York Historical Society, in association with D. Giles Ltd, 2007. Eidelberg, Martin P., et al. Behind the Scenes of Tiffany Glassmaking: The Nash Notebooks : Including Tiffany Favrile Glass by Leslie Hayden Nash. New York: St. Martin's Press, in association with Christie's Fine Arts Auctioneers, 2001. Frelinghuysen, Alice Cooney, and Elizabeth Hutchinson. Louis Comfort Tiffany and Laurelton Hall: An Artist's Country Estate. New York: Metropolitan Museum of Art, 2006. Johnson, Marilynn, et al. Louis Comfort Tiffany: Artist for the Ages. London: Scala, 2005. Jones, Robert O. D. Maitland Armstrong: American Stained Glass Master. Tallahassee, FL: Sentry Press, 1999. Koch, Robert. Louis C. Tiffany, Rebel in Glass. New York: Crown Publishers, 1966. McKean, Hugh. The "Lost" Treasures of Louis Comfort Tiffany. New York: Doubleday, 1980. Reynolds, Gary. "Louis Comfort Tiffany." American Arts and Antiques. March/April 1979; 36-45. Zapata, Janet. "A Tiffany Museum." The Magazine Antiques. March 1995, 428-435. Text by Barbara Krueger, Michigan Stained Glass Census, May , 2008.